You may remember watching Al Gore’s documentary in the early 2000s, and since then, you have witnessed climate change become a mainstream topic. You’ve probably also heard counter-theories that climate change is not caused by humans or that it is not happening at all. Perhaps you continue to believe the climate scientists, but the tiny seed of doubt in your mind justifies not making drastic personal lifestyle changes. For instance, you know you should be driving less, but instead of decreasing your driving, you just increase your guilt; same thing whenever you forget to bring reusable bags to the grocery store. If you’re a bit more conscientious and concerned, perhaps a nature or animal lover, you may have watched other documentaries, like Cowspiracy, or read books, like Naomi Klein’s This Changes Everything; maybe you cut down (or cut out) your meat consumption, recognizing its negative environmental impact; or bought an electric vehicle; or even started commuting by bike. No matter what you’re doing though, you have probably noticed the weather continuing to get warmer and weirder—flash floods, massive snowstorms, bizarre sinkholes, drastic changes in temperature—which you jokingly (but seriously) attribute to climate change, then continue on your way, because really, as one of over 7 billion people in the world, what can you do to fix this? However, as it turns out, there is something you can do, something we all can do. Research is showing that applying quick-fix, technical solutions, like switching to LED lightbulbs or buying an electronic car, can only help so much. This does not mean we should stop—it still helps, it just won’t fully fix the problem. Instead, it is becoming apparent that in order to fix climate change, we must also address the underlying reasons it is happening: the societal reasons, the psychological reasons, the spiritual reasons. BUT, before we can even address the reasons, we must first accept it’s a problem. The first part of any Twelve Step recovery program, like Alcoholics Anonymous, requires the individual to admit and accept that s/he has a problem; unless this can happen, no healing can take place. Similarly, we as individuals and as a society will only be able to heal our world if we can first admit and accept that climate change is real, it is a problem, and humans are at least one, if not the sole, cause. Some of you might be thinking this is obvious. Yet, given that the U.S. currently has a climate-change-denying president, clearly not all of society agrees. According to research, white males, like the current president, are more likely to disregard climate change than women (McCright 66) and people of color (van der Linden 18). However, this obviously does not apply to everyone. My husband is a big supporter of climate science and lives an environmentally sustainable lifestyle. Knowing this, I was not surprised to learn that political orientation—which is related to gender and race—is actually the biggest distinguisher between those who believe versus disregard climate change, especially in the U.S where Republicans are much more likely to disregard climate change than Democrats (van der Linden 18). As you likely know, carbon emissions from humans are the leading cause of climate change. High levels of CO2 in Earth’s atmosphere lead to holes in the ozone layer, increasing global temperatures, rising sea levels, and a broad range of other negative effects to Earth’s ecosystems (Steffen et al. 843). Yet, as one scientist described it, “climate change is only the tip of the [melting] iceberg” (Steffen et al. 843). Humans are also responsible for other changes to the Earth, such as modifying the landscape and flow of rivers (we build cities, tunnels, dams, etc. ); altering the cycles of elements fundamental to life, like nitrogen (carbon isn’t the only damaging element we emit into the air); and driving the sixth major extinction in Earth’s history (good-bye West African Black Rhinoceros, Caribbean Monk Seals, Tasmanian Tigers, and so many more) (Gerken; Steffen et al. 843). Due to these drastic changes, some climate scientists propose we have entered a new geological epoch, which they call the Anthropocene (Anthropos = human). As a Teaching Fellow at Harvard described to me this semester, if aliens come to Earth in millions of years (assuming the planet is still around), they would not be able to tell the story of Earth without also telling the story of humans; we, humans, have made such a drastic impact on the Earth that we have become a major player in its story (Thomas 1590). What is crazy about this is that past epochs in the current Cenozoic Era have generally lasted between 21.9 million and 1.78 million years. This means, when looking at rock layers and fossils, that Earth’s landscape and plants/animals remained similar for millions of years before changes became noticeable. Yet, the most recent epoch, the Holocene, only started 11,700 years ago! If things had gone as normal, the Earth may have been stable in the Holocene for over a million years… Instead, Earth’s atmosphere, climate, biodiversity, and geology have shifted so dramatically in the last 200 years that the planet meets the criteria for a new epoch (Steffen et al. 842). 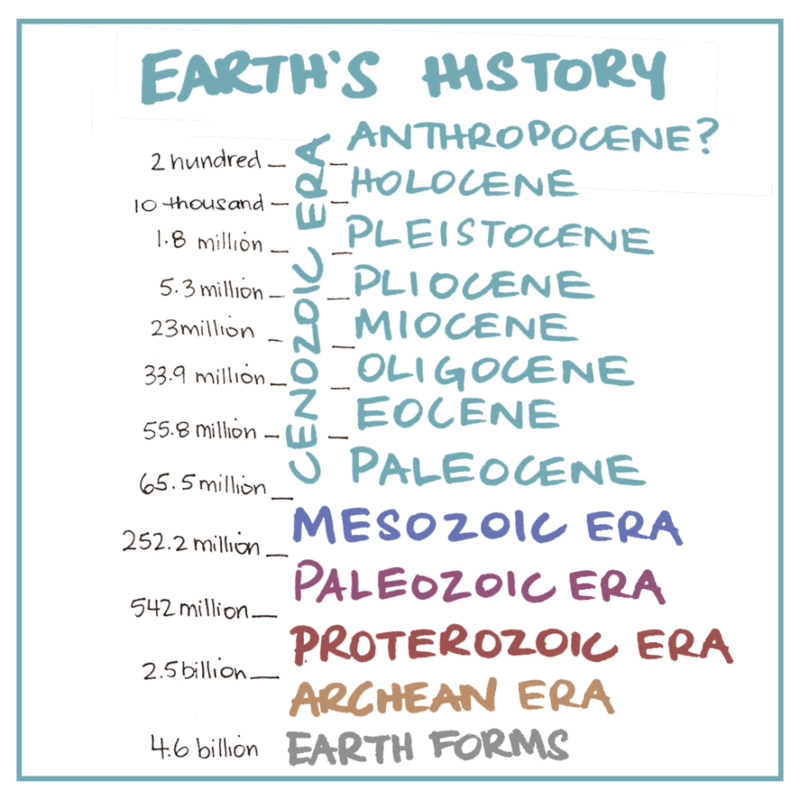 But, even if we agree the Earth is in a new geological epoch, is it right to call it the Anthropocene? Some claim this decision is up to scientists, but others argue naming the epoch after humans requires input from those who study humans (i.e., historians, psychologists, sociologists, etc.) (Thomas 1588). As some of these social scientists have further pointed out, to blame all of humanity for climate change is not accurate. In actuality, the capitalism and consumerism of developed nations is the main contributor to climate change; it is our focus on making money and buying stuff—our greed—that is causing the Earth to breakdown (Klein). Yet, developing countries are going to experience the worst effects (Nixon 5). In this unfair balance of power, is it right to blame everyone equally? Many scholars think not and instead propose the name, Capitalocene, to focus on the specific issue (Hartley 155). However, while this name may better explain the cause, it does little to promote changing our capitalist and consumer patterns. In fact, it seems to normalize it, as though stating, this is just the way it is. But is that okay? Is it okay for us to overwork the Earth? Heat it up until it collapses in defeat? I have over the years heard people say the Earth was given to us by God to use as we will (Skirbekk 1). But even with that perspective, I do not understand why we would harm the Earth. If you are given a precious gift, do you tear it apart? Or do you treasure it and treat it with respect? No matter our reasoning, when considering how poorly humans treat the Earth, there is an enormous lack of Connectedness. When we feel like it is okay to reap and not sow, to take and not give, to hurt and not heal, we are perpetuating disconnection, which in turn harms nature, ourselves, and our communities. Climate change is no longer about reducing emissions. It’s much more about how we hold onto our humanity as we navigate this intense period of change. We’re going to have to be much more connected to what our shared values are. And we’re going to have to approach things on a much deeper level (Kahn). …the truth is that humans are marvellously resilient, capable of adapting to all manner of setbacks. […] But surviving is not the same as thriving, not the same as living well. And as we have seen, for a great many species it’s not the same as being able to nurture and produce new life. Just because biology is full of generosity does not mean its forgiveness is limitless. With proper care, we stretch and bend amazingly well. But we break too—our individual bodies, as well as the communities and ecosystems that support us (442). Accordingly, I see climate change as boiling down to one question: Are we in control of nature or are we a part of nature? At the beginning of this post, I said there is something we can all do to help climate change. If you haven’t guessed already, I am not suggesting more technological fixes. Instead, I am suggesting a perspective shift. Like Tim DeChristopher said in his interview, and Naomi Klein suggests in her book, if we want to ride out the storm of climate change, if we want to heal the Earth, we need to start seeing ourselves as part of nature; we need to see ourselves as connected to nature. We may live in skyscrapers high above the ground, we may spend most of our time looking at screens, and we may primarily see raw nature through the windows of our planes, trains, and automobiles. But, at the end of the day, whether we like it or not, we are part of nature. Our bodies rely on the Earth for clean air to breathe, water to drink, and food to eat. We may (over)process much of this before it enters our bodies, but the key ingredients still come from the Earth, as do we. Whether we admit it or not, and no matter how much plastic surgery we undergo, our bodies will age and return to the Earth. There is no Man vs. Nature. 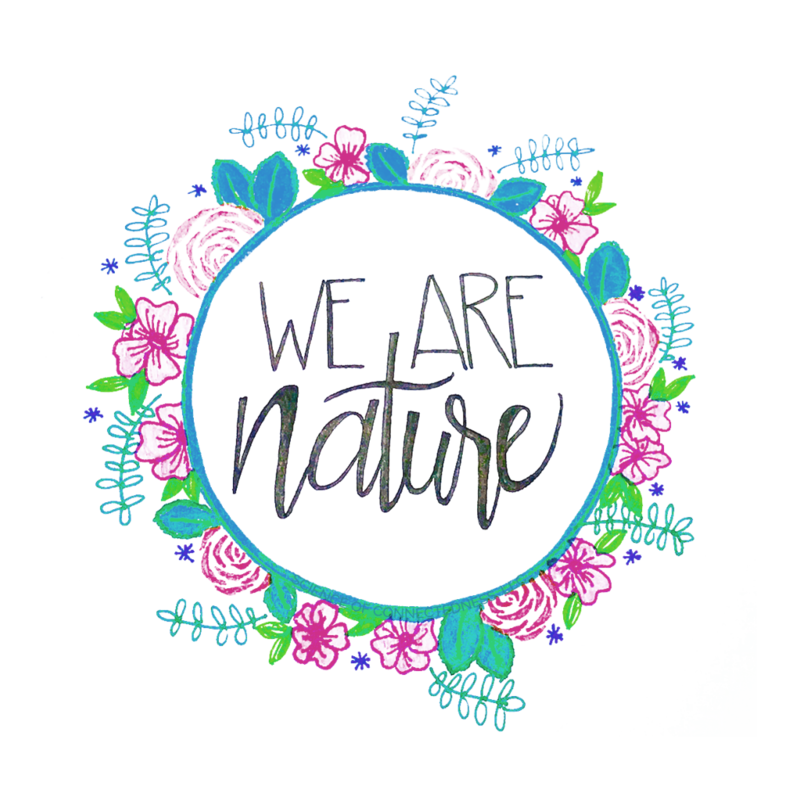 Nature is us and we are nature. If we change our perspective, see ourselves as part of nature instead of avoiding nature, and allow ourselves to feel a connection with nature (which, as you may remember, is part of my definition of spirituality), living an environmentally sustainable lifestyle feels easier. I know that when I feel a connection with nature, I am more likely to commute by bike—it helps nature, and it helps my body, which is part of nature! I am also more likely to think about what I buy, what I eat, and what I support. Plus, I’m not the only one: A 2014 research study showed that feeling Connectedness with nature is highly predictive of living a sustainable lifestyle (Hedlund-de Witt 48). Consequently, I’m not recommending we force ourselves to adopt environmentally sustainable habits. If we are not motivated to create these habits, they will feel impossible to maintain. Instead, I am recommending we cultivate Connectedness with nature, allowing ourselves to remember we are part of nature and nature is part of us. If this happens, my guess is the sustainable habits will ‘naturally’ ease into place. We may be one of over seven billion humans, but collectively, we can change the world—we have once already in a negative way. Now, let’s change it in a positive way. Hartley, Daniel. “Anthropocene, Capitalocene and the Problem of Culture.” Anthropocene or Capitalocene (2016): 154-165. Hedlund-de Witt, Annick, Joop De Boer, and Jan J. Boersema. “Exploring Inner and Outer Worlds: A Quantitative Study of Worldviews, Environmental Attitudes, and Sustainable Lifestyles.” Journal of Environmental Psychology 37 (2014): 40-54. Klein, Naomi. This Changes Everything: Capitalism vs the Climate. New York: Simon and Schuster Paperbacks, 2014. Koss, Sarah E. and Mark D. Holder. “Toward a Global Understanding of Spirituality and Religiosity: Definitions, Assessments, and Benefits.” Spirituality: Global Practices, Societal Attitudes and Effects on Health. Hauppauge, NY: Nova Science Publishers, 2015. McCright, Aaron M. “The Effects of Gender on Climate Change Knowledge and Concern in the American Public.” Population and Environment 32.1 (2010): 66-87. Nixon, Rob. Slow Violence and the Environmentalism of the Poor. Harvard University Press, 2011. Skirbekk, Vegard, et al. “Religious Belief and Environmental Challenges in the 21st Century.” Population Environment Research (2017). Steffen, Will, et al. “The Anthropocene: Conceptual and Historical Perspectives.” Philosophical Transactions of the Royal Society of London A: Mathematical, Physical and Engineering Sciences 369.1938 (2011): 842-867. Thomas, Julia Adeney. “History and Biology in the Anthropocene: Problems of Scale, Problems of Value.” The American Historical Review 119.5 (2014): 1587-1607.
van der Linden, Sander. “Determinants and Measurement of Climate Change Risk Perception, Worry, and Concern.” In M.C. Nisbet, M. Schafer, E. Markowitz, S. Ho, S. O’Neill, & J. Thaker (Eds. ), The Oxford Encyclopedia of Climate Change Communication. Oxford University Press, 2017.